Ever since I first listened to Hamilton a few months ago, this musical has had an enormous impact on me. A few months ago, our very own Sky gave us a ranking of her favorite Hamilton songs, and this is my response with my own favorites. There's a reason I love this song. Unfortunately, I can't pinpoint it. But I will say that I love how real it is. It feels like Burr just strolled onto stage and started literally singing his heart. This song is the motivation behind practically everything he does... until the second act. Compared to the other songs in this show, it's not complicated or full of detail. It's simple and clear and direct, and it says a lot about a man whose personal beliefs were shrouded in secrecy. This song gets me every time I listen to it. First, we have Burr, and his perspective on fatherhood really gives us a different take on his character. He really knows how to love, and his daughter becomes everything to him in the space of a few minutes. But then you have Alex Hamilton. And somehow, his part of the song just confirms everything you already knew about him. He's so articulate before he has a son, but after he meets Philip, he's practically speechless. But it's something that's so in character that it doesn't surprise us at all, and that's what I love about "Dear Theodosia." This is the song that made me sob. This is the song that makes everything that came before worth it, even though it's filled with pain. This is a song of redemption and slow forgiveness. "It's Quiet Uptown" is one of the most accurate depictions of grief that I have ever seen in any story, and even though it hurts to listen to, it's also vital to the impact of the show. This is one of my favorite finales to any musical ever. It's a chance for Eliza to step into the spotlight and tell Hamilton's story, and in so doing, tell her own. She learns to live her life without her beloved Alexander. It's a fantastic artistic choice to have her narrate the last song of the show as she continues on her husband's life work. It's a reminder that life goes on and that there can still be good things through the pain. This song captures a crucial moment in American history, one that has lived on the minds of many people as an early scandal in our history. And yet, this song becomes so much more than just telling the simple story of a duel. It takes everything we've learned about these two men, Hamilton and Burr, and packs it all into a five minute song in such a way that we understand what their thoughts and motivations are. We understand the conflict between them. These two songs really show us the minds of two marvelous women who were largely at the center of Hamilton's life. "Helpless" makes me so happy. The feeling of love just filling the room when Eliza and Alexander sing this song is so strong and it's just so... jubilant. "Satisfied" really picks up the narrative strings of "Helpless," and we see the situation more in-depth. This is Angelica's heart, and she drops it in front of the audience in a way that really says a lot about her. She's vastly intelligent, and she sizes up the situation in seconds, knowing that she can't pursue what she wants. 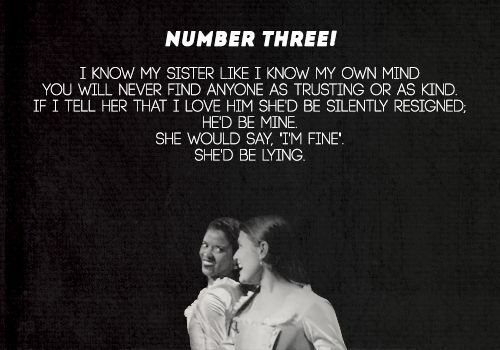 Her sister is far more important to her than a man ever could be. This songs breaks me. Hamilton broke Eliza's trust in an unfathomable way, and this is her answer. She takes herself out of the narrative, and she has to learn to go on through heartbreak. This isn't an easy song to listen to, but it is important. The contrast in this song between Hamilton's childlike pleading and Washington's joyful acceptance is truly something to see. It says something really special about Washington's integrity that he is willing and even eager to give up power, even when a man that is like a son to him begs him not to. Lin-Manuel Miranda's writing is fantastically on display here. He truly knows his characters and how to get not only the point, but also the familiar emotions behind all of the character's actions, across to the audience. I think that this really shows up in this song, and that's why it made my list. Hamilton, so seeing it introduced in this way is really important if they're to be likable characters, considering they're mostly opposed to Hamilton for the duration of the story. 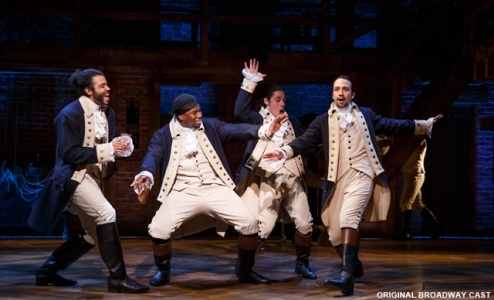 Their unlikely friendship is one of the reasons why Hamilton is so much fun to watch. This is fantastic. Not only does it feature the crazy high-speed rapping of Daveed Diggs, it's also just plain fun to listen to. Lafayette, otherwise known as "America's favorite fighting Frenchman," is one of the most interesting and eccentric characters in the whole musical, so listening to him headline a song is a change of pace from the rest of the characters. This whole song has such ingenious wordplay and phrasing that I am simply blown away every time I listen to it. I mean, where else can you hear phrases like "ingenuitive and fluent in French"? This song practically embodies who Hamilton is. He works and works, and he doesn't know how to stop (nor does he want to). But this is also the first song where we see pain leaking through the work and drive of this man. He's working to drown out the pain from Laurens' death, he's working to ignore the pleas from his wife, he's working non-stop. This song perfectly captures the intrigue and secrets that come with having power. Even though it's after "Cabinet Battle #1," I think it really kicks off the political feeling that's so prevalent throughout the rest of the musical. It's just the slightest bit sketchy and shady and, through Burr's eyes, we start to wonder if what Hamilton is doing is right. We see Burr desperately wanting to join in on what's happening in "the room where it happens," but he can't. He continues the path of being an antagonist that we feel empathy and understanding for. 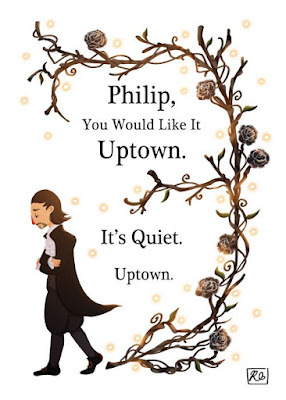 I love anything with Philip Hamilton in it. As we watch the musical, we grow with Hamilton, and we see Philip through a different light than we would have at the beginning. Philip is young and foolish and his father's son, and those are precisely the reasons why we love him. He's extremely endearing and that's why these two songs hit me so hard. Picking the songs that have the most impact on me from a musical where all the songs have been a major influence in my life was a nearly impossible task. There are many that I was not able to include, including King George's songs and everything else with Washington. But my love for those songs is not lessened! Since my favorites from this musical are constantly changing, next week I will likely have an entirely new list. What are your favorite songs from Hamilton? Are there any I haven't included that you love? Aghh, I like all of the songs. How can I choose?!? I would definitely put Wait for It, Burn, You'll Be Back, and Stay Alive towards the top. <3 They are all my favorites.